The stigma of this flower has yellow pollen stuck to it. 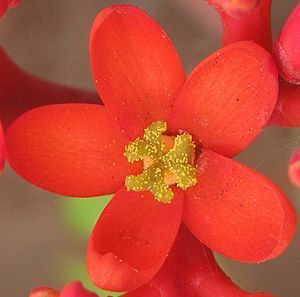 A stigma is a part of a flower that gets pollen from pollinators such as bees. The stigma is part of the female reproductive part of a flower, the pistil. The stigma is on top of the style. The stigma can be either hairy or sticky, both to trap pollen. When the pollen lands on the stigma, the pollen will grow a pollen tube down the style, and into the ovary of the pistil. Stigma (botany) Facts for Kids. Kiddle Encyclopedia.